On August 21, 1917, at Hill 70 Lens, France, Company Sergeant-Major Hanna's company met with most severe enemy resistance at a heavily protected strong point, which had beaten off three assaults and all the officers of the company had become casualties. 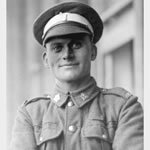 This warrant officer, under heavy machine-gun and rifle fire, coolly collected and led a party against the strong point, rushed through the wire and personally killed four of the enemy, capturing the position and silencing the machine-gun. This courageous action was responsible for the capture of a most important tactical point.